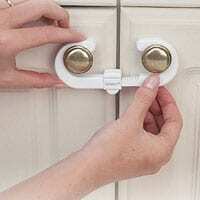 Safety 1st Sure Fit Toilet and Cabinet Locks have been recalled by CPSC. Children are able to break or disengage the locks, thereby gaining access to water in the toilet and dangerous items stored in cabinets. The manufacturer, Dorel Juvenile Group, has received 110 reports of toilet locks that did not adequately secure the lid, and 278 reports of cabinet locks that did not adequately secure the cabinet. In one of the reported incidents, a 13-month-old boy swallowed toxic beads from a craft kit and was admitted to hospital. This recall involves Safety 1st Sure Fit toilet locks with model numbers 48003 and 48103 and Safety 1st cabinet slide locks with model numbers 12013 and 12014. Consumers should immediately remove the recalled locks and contact DJG on (877) 416-8105 or visit www.djgusa.com for a free replacement lock of a different model. Parents and caregivers are urged to store dangerous items out of reach of children and to prevent unsupervised access to bathrooms. For more information on baby proofing, visit the article Preparing The Nest.